As the lights went out over the Uptown! Knauer Performing Arts Center, and the ensemble tranced onto stage for the first number of the Resident Theatre Company (RTC)’s “Dirty Rotten Scoundrels,” I immediately wrote down the word “Confidence.” Ironically enough, this word would continue to define both the narrative of the adaptation, and the production itself: confidently staged, confidently choreographed and confidently orchestrated. Much like Lawrence Jameson, one of the titular “dirty rotten guys” deftly portrayed by Mark Woodard, this confidence only served to benefit the experience. As “Dirty Rotten Scoundrels” was the first show I saw at the Uptown!, I needed to take specific note of the space which surrounded the production. Built from the shell of an old military bunker, the building itself lives on a bit of a contradiction; how the spartan structure could elegantly complement the cozy theater setting is, frankly, beyond me. And yet, it worked, and only served to bolster the contradictions of the show itself: an adaptation of the irreverent 1988 musical comedy which, through sheer force of acting, delivered some heartfelt moments in between the jokes and jabs. Speaking of jokes and jabs, Jonathan Hadley’s portrayal of the crooked French police chief Andre Thibault stole the stage in almost every scene. Likewise, Sarah Solie’s portrayal of Muriel Eubanks, the wealthy and unwitting donor to the con artists, demanded constant, warranted attention from the audience. When Eubanks and Thibault’s plots intersected in Act Two, the on-stage chemistry between the two was irresistibly charming. The two actors complemented each other all too well, and every scene featuring them quickly became my favorites of the show. Act one of the show felt like an extended set-up of punchlines to be delivered in act two; the end of the first half offered what I would consider to be the beginning of the “main plot” of the musical, a competition between the two con artists over the cash (and heart) of Christine Colgate, portrayed by Bailey Seeker. Overall, ‘Dirty Rotten Scoundrels,’ like Jameson’s character, truly gets better with age. If act one could be considered the build-up, act two was one of constant action. While both halves were around the same length, the second act felt much faster, jumping from one scene to the next with barely a moment to breathe between. This breathless action was only made better considering how much time the audience spent laughing. One number, “Love is My Legs,” performed by Lukas Poost’s Freddy Benson and the aforementioned Seeker, stood out as an absolute highlight of the show. Even when considering the fantastically crafted twist at the end of the production (which, albeit being 30 years old, still shouldn’t be spoiled for those who haven’t seen it), I still left thinking about the hilarious delivery from Poost and Seeker. My only gripe for the show stemmed from some of the more antiquated writing. One scene, centered around Benson acting in a con as Jameson’s “troubled brother” Ruprecht, came across like the oil heiress’s description in the show: a bit crude. However, this can easily be explained away as a tiny blemish of writing on an otherwise fantastic show. Overall, “Dirty Rotten Scoundrels,” like Jameson’s character, truly gets better with age. Since my viewing of the show on its March 29 opening, my feelings for the production have only grown fonder. Considering the RTC offers “student rush tickets” for only $15 per performance with a student ID, I cannot stress enough how worth it seeing this show is. 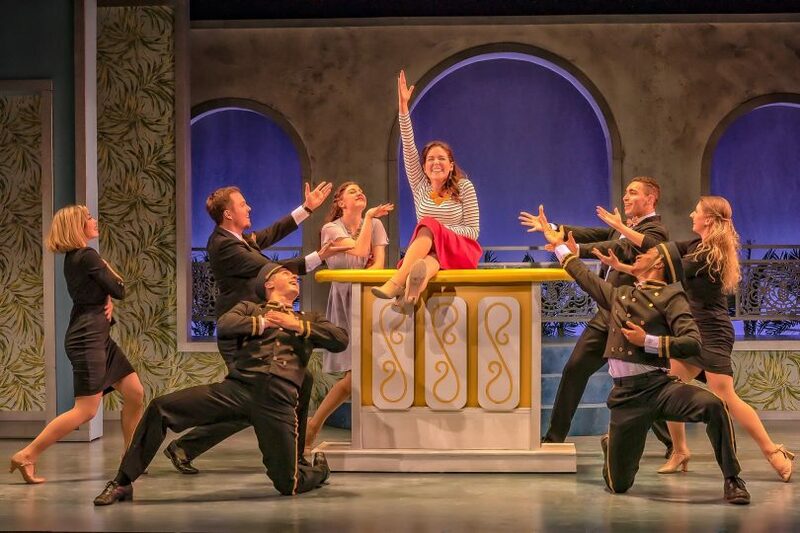 “Dirty Rotten Scoundrels” at the Uptown! Knauer Performing Arts Center is running now until April 14.